The gutters along the perimeter of your roof in Madison, Wisconsin, or any surrounding community are an important protection mechanism for your house. 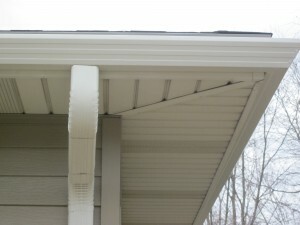 Your gutter system channels rain water and snow melt away from your home’s foundation, allowing it to seep harmlessly into the soil, rather than making its way into your basement and causing costly damage. If your gutters need to be replaced in order to provide the optimal level of protection for your home, call ABC Seamless Home Specialists. Superior strength – Our gutter system will easily handle the weight of snow and ice, and can support a ladder leaning against it with ease. Beautiful appearance – Our finishing process produces gutter troughs that won’t get chalky, even after years of sun exposure, keeping their good looks long into the future. Flawless integration – Our gutters are designed to blend effortlessly into your soffit and fascia, so you hardly even know they’re there. To learn more about our gutters and how they can help protect and beautify your home in or near Madison, WI, contact a representative at ABC Seamless Home Specialists today.